A ha! 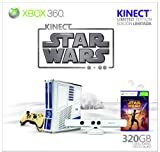 With the latest blast of screenshots for Kinect Star Wars, we should have known that official release dates for the delayed Kinect Star Wars game and the awesome looking Xbox 360 Limited Edition Kinect Star Wars console bundle were not far behind. So finally, for those who desperately needed one or the other to get your Star Wars fix, you can do so on April 3rd, 2012. Xbox 360 Console: Bring the Star Wars characters you know and love into your living room with this custom R2-D2-themed Xbox 360 console with custom sounds. Kinect Sensor: Includes the first ever custom white sensor. Immerse yourself into the Star Wars universe with full-body gameplay. Xbox 360 Wireless Controller: Includes custom C-3PO-themed Xbox 360 Wireless Controller. Kinect Star Wars game: Enter the Star Wars universe like never before. Use the Force like a Jedi, become a champion Pod Racer, pilot iconic ships and much more. Kinect Adventures game: Get off the couch and into the game in a whole new way. You and your friends and family will jump, dodge, and kick your way through 20 pulse-pounding adventures set in exotic locations. Pre-order that crazy piece of hardware below or read on for more details on Kinect Star Wars and the console bundle. New Duels of Fate mode, a battle-by-battle experience to sharpen your Jedi skills against the Dark Side. Additionally, the Xbox 360 Limited Edition “Kinect Star Wars” console bundle will feature an exclusive C-3PO unlockable for Dance Mode. With these new reveals and the ability to play in 3D, “Kinect Star Wars” adds to the growing popularity of the family-friendly gaming portfolio for Kinect for Xbox 360. Fans of the game can get a sneak preview on Saturday, February 11th at select AMC Theatre locations across the United States. In celebration of the theatrical release of Star Wars: Episode I The Phantom Menace 3D on February 10th, select theatres will feature a day full of Star Wars activities, including hands-on time with “Kinect Star Wars.” For participating theater locations, please visit http://www.starwars.com/news/episode_1_amc_screenings.html.